I know I just posted here a few days ago. I hope you’re not getting sick of me! 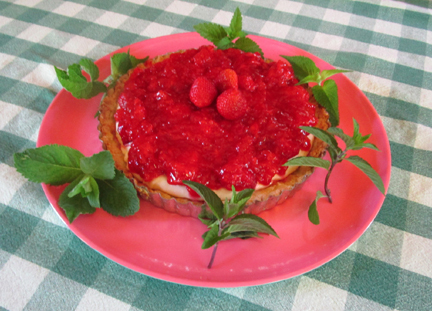 I thought readers might like to make this festive tart for the Fourth of July, however. The recipe has a number of steps so technically it takes a lot of time. Most of the time is spent waiting for portions of the tart to cool, however, so it’s not hard. The only thing you have to bake is the crust—and that can be done early in the morning or late at night so you won’t heat up the house too much in this warm season. And the tart is a definite showstopper. I tend to make it the day before I serve it. Yes, you may use a store-bought pie crust, but this one isn’t hard. You may also use lemon juice instead of key lime. As I point out in the video below, if you want to be particularly patriotic, you may put a few blueberries on top of the tart. Grease a 9-inch tart pan. (You may use an 8-inch pie pan if you’d rather, but the tart is just beautiful.) Place the dough in the pan. Press it evenly over the bottom and up the sides of pan. Prick the bottom of the crust a bit to keep it from puffing up too much. Put the crust in the freezer, uncovered, for 15 minutes while you preheat the oven to 375 degrees. Bake the crust for 15 to 20 minutes or until it is golden brown. Cool it completely before filling it. 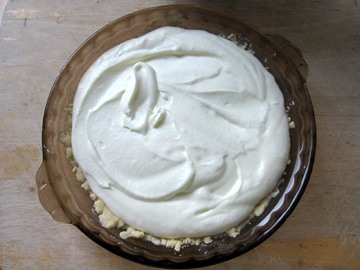 To make the filling beat the cream cheese until it is soft and smooth; then beat in the condensed milk and the key-lime juice. Spoon this mixture over the cooled crust, and refrigerate for several hours before proceeding. Finally, make the topping. In a heavy saucepan whisk together the cornstarch, the sugar, and the salt. Slowly whisk in the liquids. In a bowl, mash 1-1/2 cups of the berries. Add them to the cornstarch mixture. Let the mixture sit in the saucepan for 1 hour to juice up. 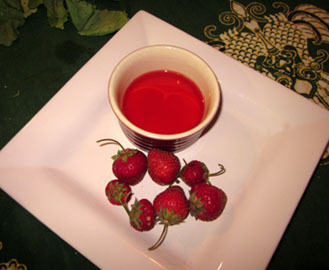 At the end of the hour bring the berry mixture to a boil, and boil it for 1 minute, stirring constantly. Remove it from the heat and let it sit until it reaches room temperature. Stir in the remaining uncooked berries. Spoon the topping over the tart filling. Refrigerate the tart until you are ready to serve it. Garnish with additional strawberries and mint leaves if you wish. Serves 8. 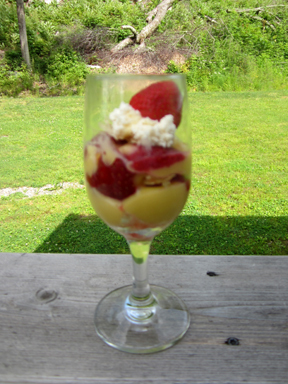 Shari’s Berries recently wrote to me (and I presume to a lot of other bloggers) to suggest that I post a recipe before next Wednesday, June 25, to celebrate National Strawberry Parfait Day. 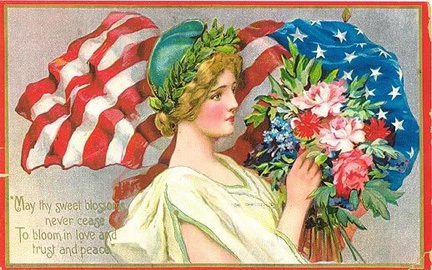 I had never heard of this holiday. But I’m happy to celebrate! The woman from Shari’s Berries defined a strawberry parfait as “a delicious way to showcase berries along with layers of cookies or cake all tied together with some yogurt or pudding.” As soon as I read this description it occurred to me that a dessert I had been contemplating would qualify as a parfait: Strawberry Napoleons. As regular readers know, I am a Napoleon fan, having made Key-Lime Napoleons a couple of years ago. As strawberry season dawned last week, I decided that it might be fun to adapt that recipe with another of my favorite fruits. I thought the idea was completely original to me—until I purchased some Pepperidge Farm puff pastry and saw a recipe for the very same thing on the side of the box! Luckily, my recipe is and was a bit different; PF was desecrating its strawberries by suggesting that the home cook use pudding mix instead of making pastry cream. No, no, no!!! 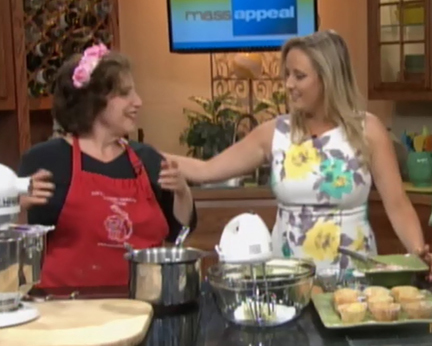 The Napoleons seemed perfect for my projected garden-party theme on this past Wednesday’s Mass Appeal television program so I decided to try making them on the air. As you can see from the video at the bottom of this post, hosts Ashley Kohl, Seth Stutman, and I experienced a few culinary mishaps. Then the Napoleons had a little trouble staying together. Luckily, Seth, Ashley, and I always have fun—and the video is worth watching for my fabulous hat alone. That night with friends—and last night as well—I experimented with the Napoleons. First, I attempted assembling only two layers of puff pastry instead of three. That worked better in terms of staying together—but it didn’t include enough strawberries and pastry cream, and those are the stars of the show! Next, I tried using only two layers of puff pastry but slicing the pastry horizontally so that the two layers became four thinner layers. This also seemed like a fairly doable alternative. It tilted, but it stayed together. I realized, however, that I really didn’t need much puff pastry at all to make me happy. So I made a traditional parfait in a glass (which had the advantage of holding the darn thing together!). I layered small amounts of pastry, pastry cream, and strawberries, then topped the whole thing with a little whipped cream and a whole berry. The photo below is out of focus, but you’ll get the idea. 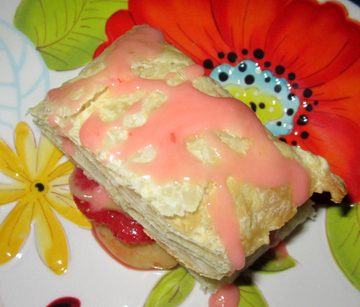 Someday I may even try just putting berries and pastry cream in a bowl with a small piece of puff pastry on the side. For now, however, I am parfait-ed out and prefer to enjoy my strawberries plain. 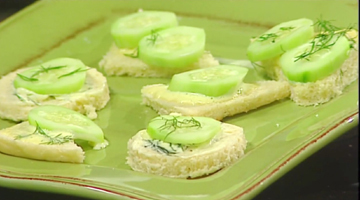 Here is the recipe as it was messily but deliciously assembled on camera. 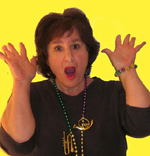 Feel free to try any of my variations—or to create your own! Bake the pastry according to the directions of the manufacturer. Let it cool, and transfer it onto a work surface. While it is cooling, you may make the pastry cream. In a heavy pan, heat the milk until it is hot, but do not let it come to a boil. Combine the sugar, flour, and salt in a bowl, and stir in the milk. Beat the mixture. Return it to the pan, and stir constantly over low heat for 4 to 6 minutes until it becomes thick and smooth. Add a bit of the warm mixture to the beaten egg yolks, and then add a bit more; then stir the egg yolks into the pastry cream. 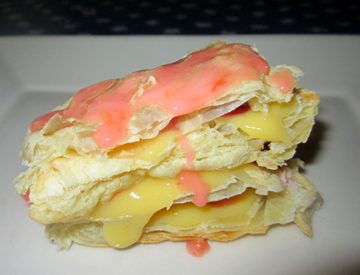 Cook for 2 to 3 minutes, until the mixture resembles a thick custard. Cool, stirring every 5 minutes or so, and then stir in the vanilla. When the pastry cream has cooled (allow at least half an hour for this), make glaze for the top of your Napoleons by stirring a little juice into 1/4 cup of confectioner’s sugar. Now you are ready to assemble your Napoleons. Cut the pastry into six pieces in the long direction of its rectangle and three pieces in the wide direction to make 18 rectangles. (Cut carefully and use a sharp knife; these steps help!) Each Napoleon will have three layers. If you want to use jam as a glue (it does help), brush a little melted jam on the top of six pieces of pastry. Dab pastry cream on top, followed by some strawberries. Add the next layer of pastry, topping it with another layer of jam (optional), cream, and berries. Top with the last six pastry rectangles, and drizzle glaze on top. (You may also place another strawberry on the top if you wish.) If your Napoleons tend to slide apart, use a toothpick judiciously. 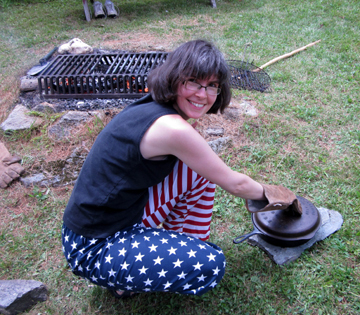 My friend and neighbor Liza Pyle made this festive pie for Independence Day. The recipe originally described a strawberry pie—although I don’t see why it couldn’t be used for just about ANY berry. Liza’s notes appear at the bottom of the recipe pretty much as she typed them. The recipe hailed long ago from Liz Simonds, a friend of Liza’s grandmother (and my honorary grandmother), Mary Parker, known to all local children as Gam. If you bake the crust early in the morning, you won’t have to bake anything later in the day—a definite advantage in July. Preheat the oven to 425 degrees. Use a pastry blender or knives to combine the crust ingredients. Place them in a LARGE pie plate (see notes below). Bake for 15 minutes. Watch to make sure that the crust doesn’t get more than a bit brown. Allow it to cool. Melt the jelly. While it is still warm brush it lightly over the tops of the berries. Let your pie stand, gently covered, in the fridge for several hours. Liza reports that 4 hours are ideal; at 8, the jelly starts to bleed unattractively but deliciously into the whipped cream. 1) Unless you use a large and deep pan (or use a tart pan), you will have too much filling and too many berries………so you could reduce the filling and berry measurements by 1/4, or move a small amount to a smaller pan, or just use a big pan (a big tart pan….even a 13 x9 will work)! 2) Just blueberries are great too………. 3) My favorite variation is to use an easy chocolate crust, made by crushing to dust in blender/processer 2/3rds of a box of Nabisco chocolate wafers and mixing it with 1/4 cup melted butter. Pat that into a buttered big pie plate on the bottom and halfway up the sides….or use a springform pan….and bake at 375 for 8 minutes. We’re lucky enough to be enjoying lovely fresh baby spinach right now in my corner of Massachusetts. 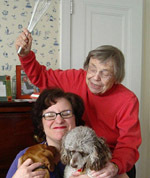 My mother and I have been wallowing in it! First, we purchased a bag at the new Charlemont Farmers Market from Sheila Velazquez of Pen and Plow Farm in Hawley. A couple of days later we went to pick up a share at our CSA, Wilder Brook Farm in Charlemont, and we were treated to more spinach! Kate and John at Wilder Brook also gave us some lovely strawberries—tiny, almost wild ones. In addition, among other veggies they handed out a root called hakurai. 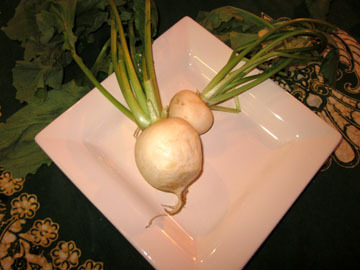 Hakurai is white and resembles a radish although it may be a little sweeter. I decided to put together a salad featuring the spinach and some of our other goodies. 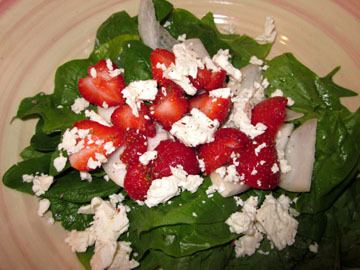 I don’t believe one can ever have too many strawberries when they are in season so I used them in the vinaigrette as well as the salad. 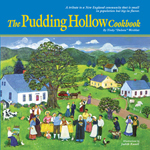 The strawberry vinegar recipe I employed is from my Pudding Hollow Cookbook. Of course, I assume that everyone reading this blog either owns this lovely tome or is about to buy it! Just in case you’re waiting for a special occasion to add it to your cookbook library, I’m giving you the vinegar recipe here. I haven’t specified exact measurements for the vinegar or a yield because the proportion of liquid you get from this recipe depends upon the juiciness of the berries you use—and how many you choose to use! Do try this salad. It’s sweet with a touch of savory. 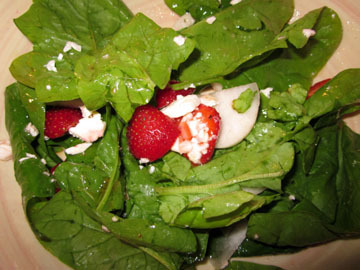 The contrasting textures of the spinach, berries, hakurai, and cheese really work together. 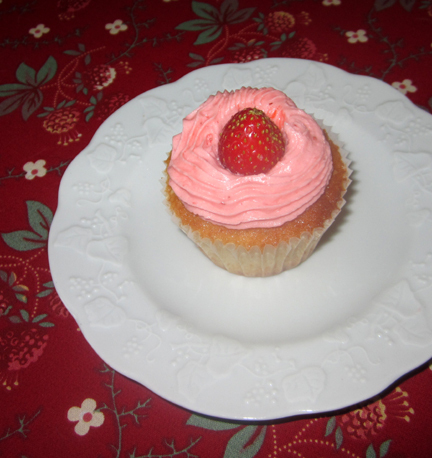 My mother looked doubtful when I put it in front of her, then promptly ate every bite and asked for more……. The day before you want to eat your salad (or any time up to a year before!) start the vinegar. 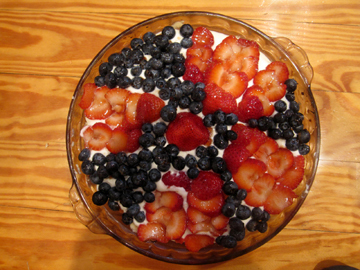 Place the berries in a non-aluminum pan (I use a porcelain dish). Cover them with the vinegar, and leave them to soak, covered, overnight. If you forget them for a day and wait 2 nights, they will still be fine. The next day (or the day after that), gently strain the juice through cheesecloth. You may squeeze the berries a little, but don’t overdo; letting the juice drip out on its own is best. Measure the juice. Then measure a little under 1-1/2 times as much sugar and water as juice (i.e., if you have a cup of juice, use just under 1-1/2 cups of sugar and 1-1/2 cups of water) into a saucepan. Cook the sugar/water mixture until it threads. Measure the resultant sugar syrup. Add an equal quantity of berry juice to it, and boil the mixture for 10 minutes. Strain this boiled vinegar through cheesecloth, and decant it into sterlized bottles. Cork or cover. 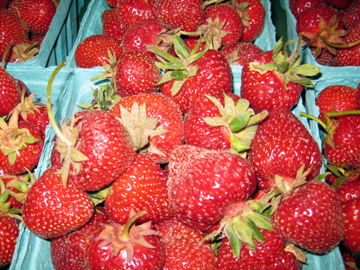 Stored in the dark, strawberry vinegar should keep its color and flavor for up to a year. When you’re ready to make the salad, combine its ingredients in a pretty bowl. Shake to combine, and toss the vinaigrette onto the salad. Serves 4 generously.